How to turn a basic bathroom into a luxurious retreat. When building our home, I had Pinterest boards filled with stunning images of bathroom inspiration. I imagined a gorgeous claw foot tub in front of a giant window with luxe marble details everywhere. However, our master bathroom somehow ended up being overlooked in the design process for our home. As we finished the floor plan, we realized we had to make a compromise… there was space for either the extra-large walk in closet I wanted or my dream bathroom. To make a long story short, I chose the closet. Needless to say our master bathroom has been a bit neglected since we moved in, but recently I decided to freshen it up and turn it into the relaxing retreat I always hoped it would become. 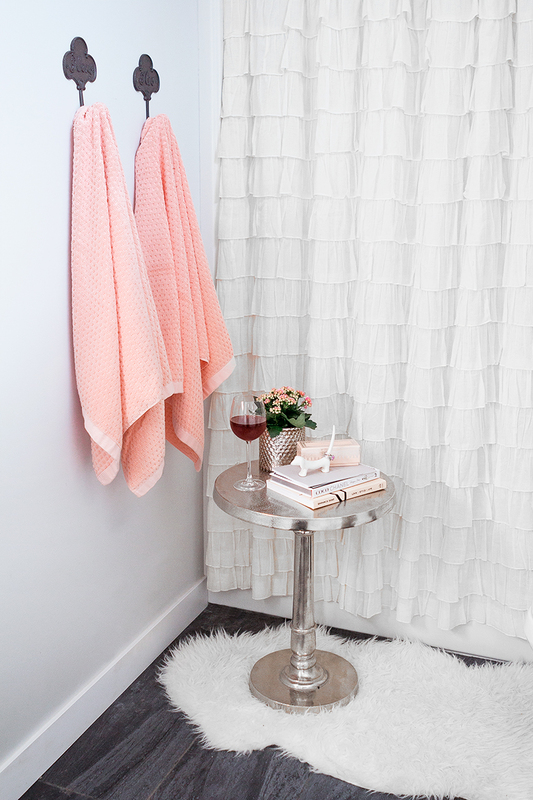 So how you turn a basic bathroom into a luxe space to unwind? It’s all about adding in gorgeous accessories! Here are the 5 things you need to add to your bathroom to transform it into a luxurious retreat. A long relaxing bath is one of my favourite ways to unwind after a busy day and a small accent table next to the tub is an absolute must-have in my opinion. It’s perfect for holding a stack of books and a glass of wine, or for keeping your cellphone within easy reach (but still dry!) if you can’t bear to turn it off for an hour. Whether it’s a pretty potted fern or bouquet of fresh flowers, a little natural texture adds so much life to a small space. In my bathroom I opted for a few flowers potted inside pretty containers. 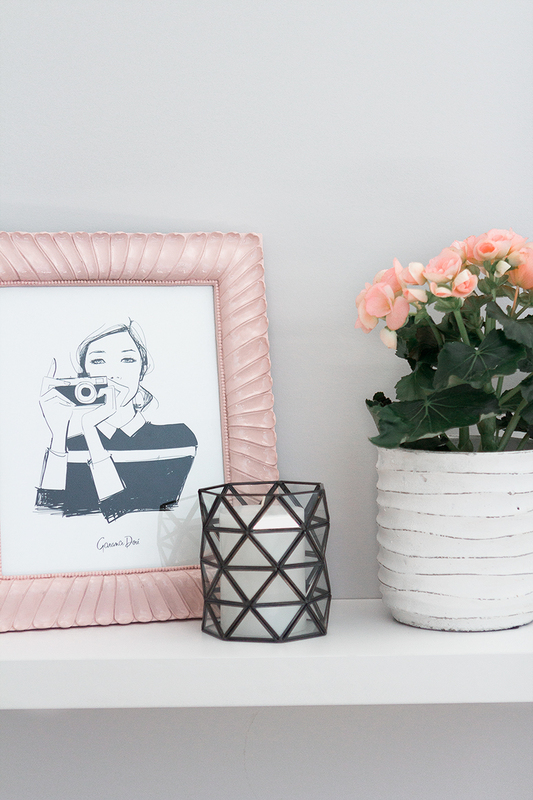 It’s the perfect inexpensive way to add long lasting blooms to a room. In my dream bathroom, I would love to hang an exquisite chandelier over the bathtub. Lighting makes a huge difference in how a space feels, but even if you are on a budget or don’t have space for statement light fixtures you can still add romantic mood lighting. Arranging candles around the room makes for the best soft lighting. Not only do they cast a romantic glow, but they also smell amazing! From drawer pulls to towel holders, updating bathroom hardware is an easy way to make your space feel more opulent. We recently added in these super cute his & hers hooks to hang our towels and I love the unique charm they add to the space. Plus, they also have the added bonus of keeping my husband from constantly stealing my towels. #Win! Instead of throwing all your beauty products into drawers, why not display your prettiest bottles & cosmetics on your counter top? 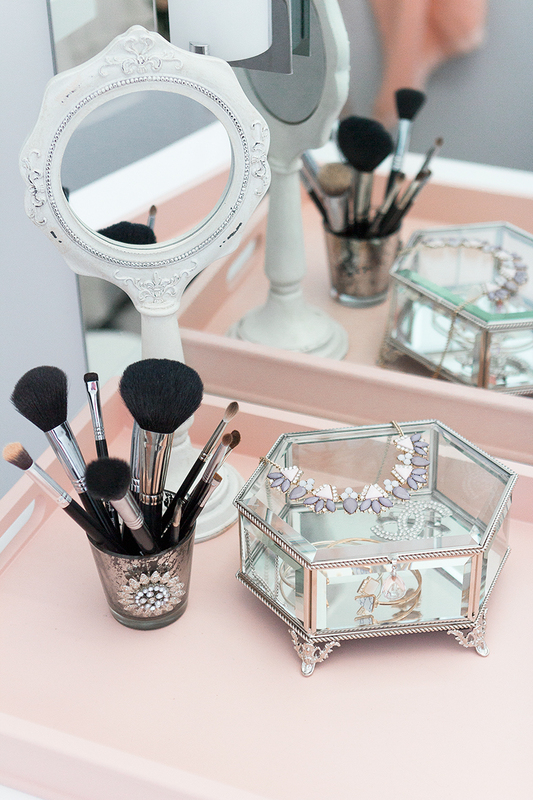 A pretty tray adds a touch of colour and texture while doubling as a catch-all for your favourite beauty products. hahaha I would also choose the closet. But i do love the little details you added to your bathroom to freshen it up. Things like that really do make all the difference! Yes, a girl needs her closet haha!!! Thanks so much for the lovely comment! 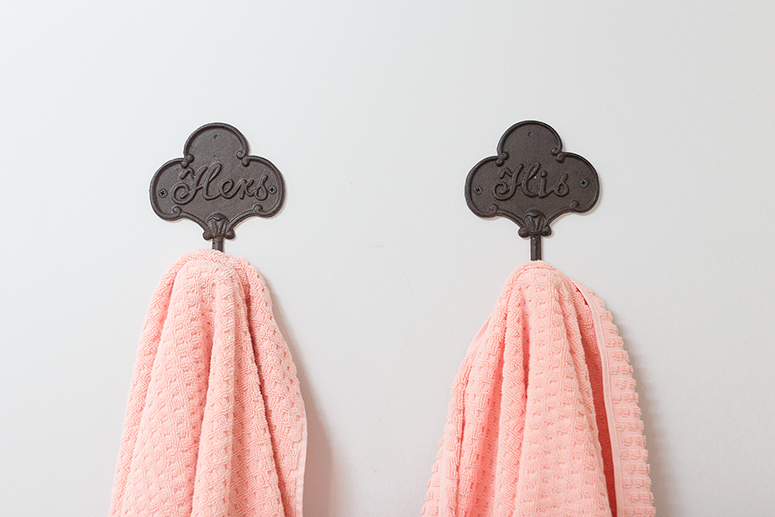 I’m obsessed with the his & hers towel hooks too! I love decorating but always seem to neglect the bathrooms. 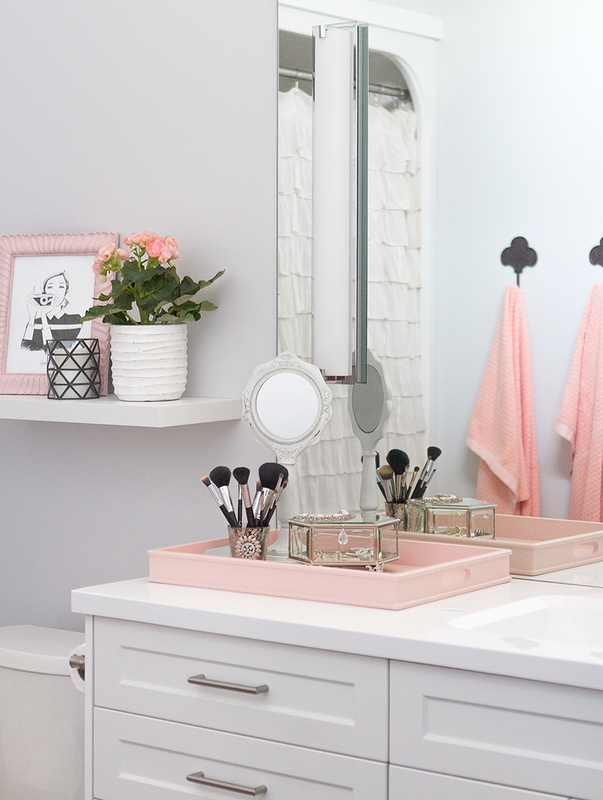 I am so excited to implement these tips and make my bathroom fabulous. Definitely want to get a plant to add a little light this weekend! Your bathroom is so pretty! While mine doesn’t have the space for an accent table, a bathtub tray works for me. 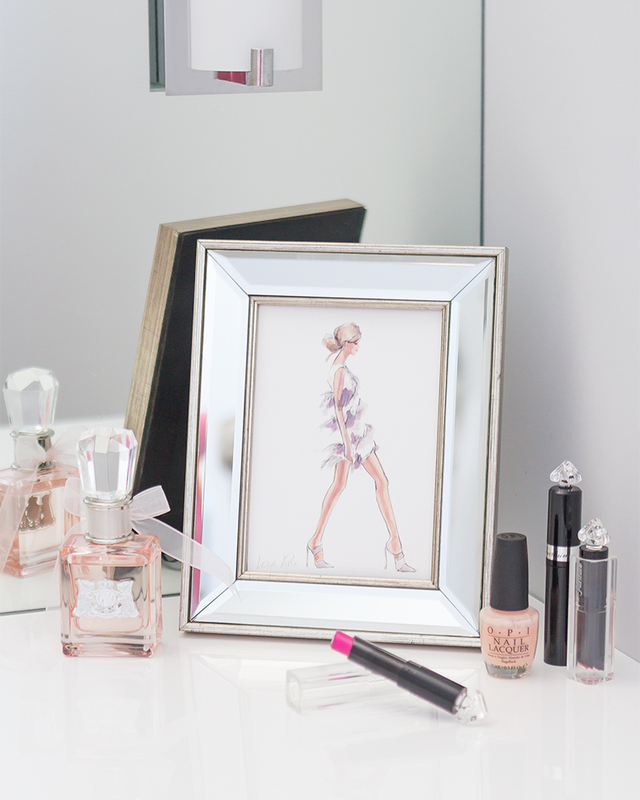 Love the tray idea too – it’s a great way to bring in a pop of color and keep everything organized! How adorable! I love the look of your bathroom! Your bathroom turned out so well! 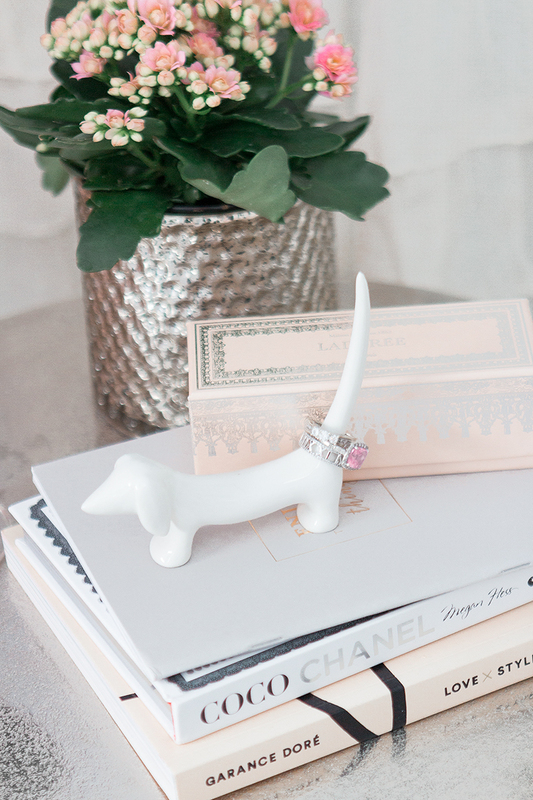 The little details like the ring holder and towel rack are so cute. I love this idea! I need to keep this in mind for my guest bath that’s a big nothing space right now. Your bathroom is stunning!! I love that accent table!